Background & Method: In this ongoing research, it is aimed to investigate the synthesis, structure identification and effects on urokinase-type plasminogen activators (uPA) and its receptor levels of 4-(3H-imidazo[4,5-b]pyridin-2-yl)-N-substituted benzamide and benzamidine derivatives. 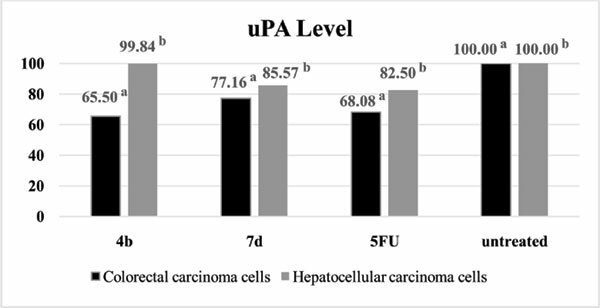 uPA levels obtained from 4b and 7d administration were similar to 5-FU (5-fluorouracil) for colorectal carcinoma cells (p<0.05). 4b and 7d significantly reduced uPAR (urokinase-type plasminogen activator receptor) levels on both cell lines (p<0.05). Conclusion: uPAR levels obtaining from 4b and 7d administration were similar to 5-FU for both cell lines colorectal (Colo205, CCL-222) and hepatocellular (HepG2, CCL-23) carcinoma cells (p<0.05). Imidazopyridine, benzamide, benzamidine, urinary plasminogen activator, uPAR, upamostat.